The magical world of comic books is totally massive and complex. 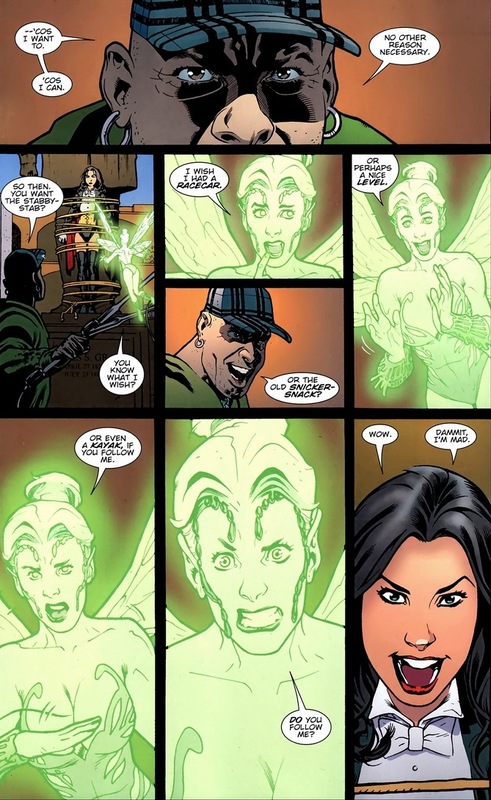 Luckily, with thousands and thousands of years of human mythology to steal borrow from, comic book characters can meet legendary monsters, wield rare artifacts, and travel anywhere from heaven to Asgard to the Phantom Zone. Plus, without restrictions like physics or reality stopping the writers, the possibilities for adventures and stories remains endless. Maybe that’s why superheroes are still going strong after 70+ years. 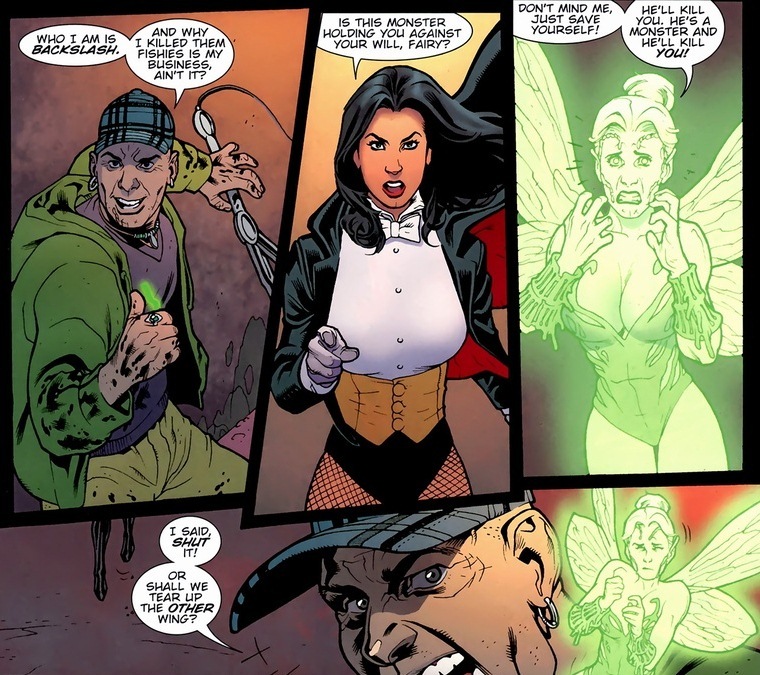 Today, we have one of the most unique of the DC magicians: Zatanna. She can cast any spell she wants, as long as she says it backwards. 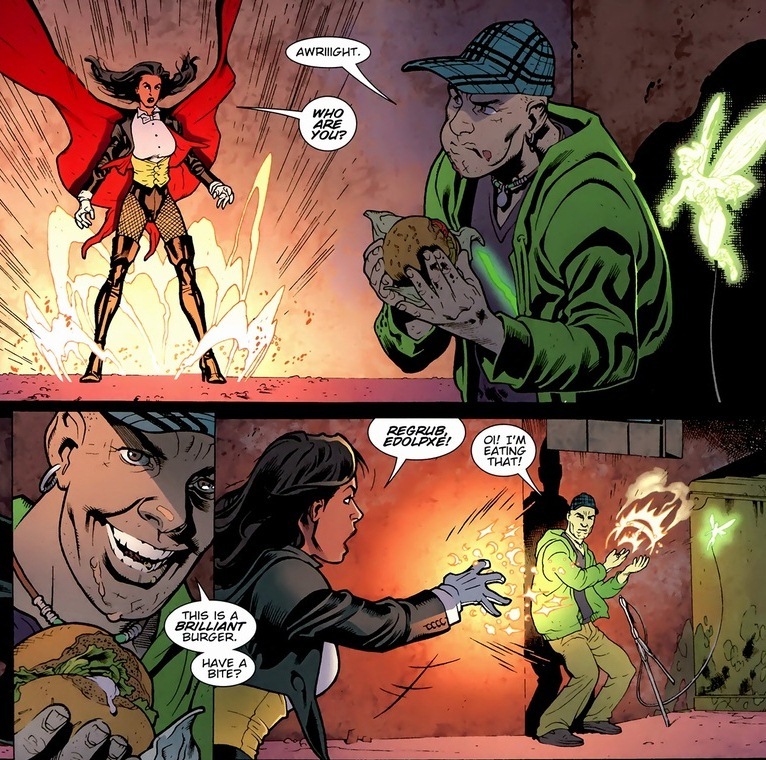 Now, her magic has limitations – it doesn’t work on living things. Though, to be fair, instead of making a man’s heart explode, she can make a chandelier crush his skull. I mean, probably not that grim, but you get the idea. 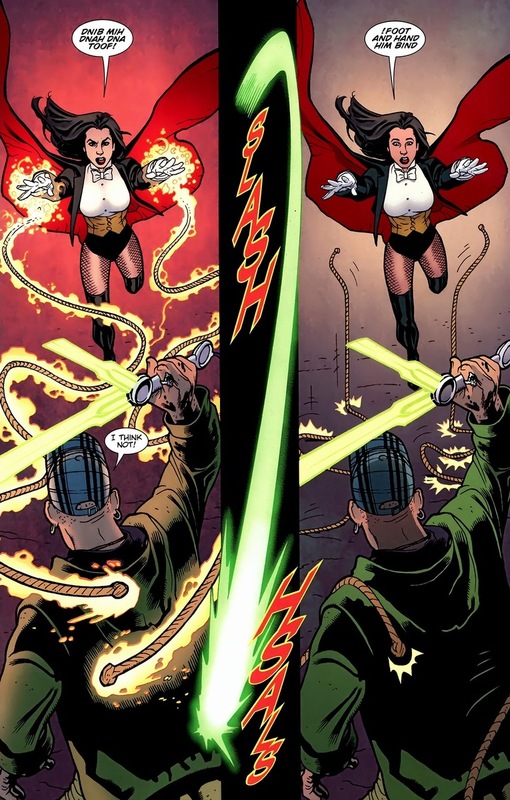 So, with that much power at her disposal, how can she successfully keep readers’ interest? 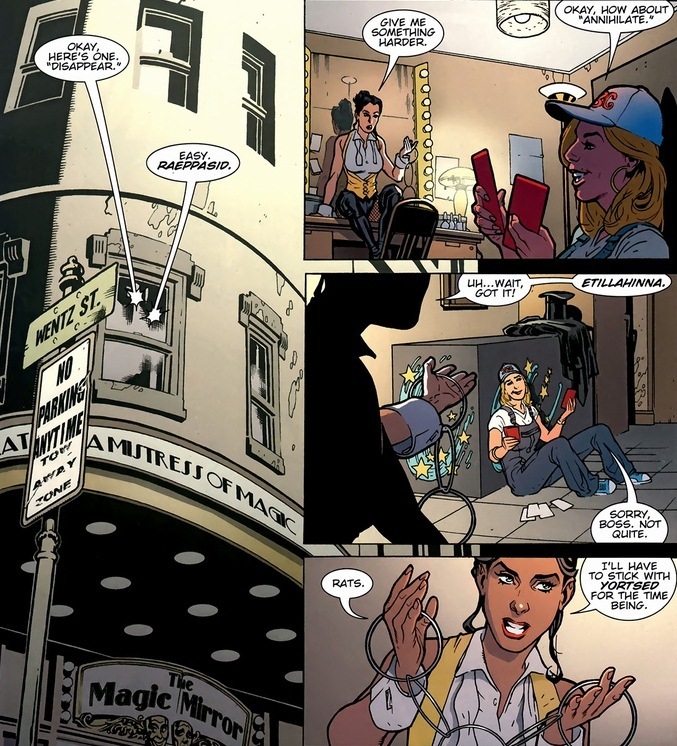 Well, writers took a shot in 2010 with her own solo series, and it turned out delightfully fun. 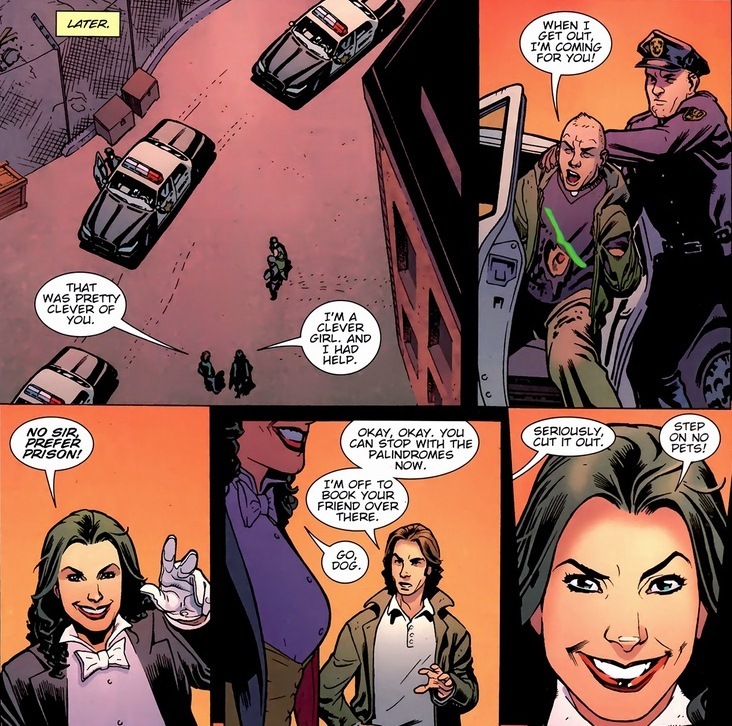 Today, we’re taking a look at Zatanna #12, written by Matthew Sturges and drawn by Stephanie Roux. 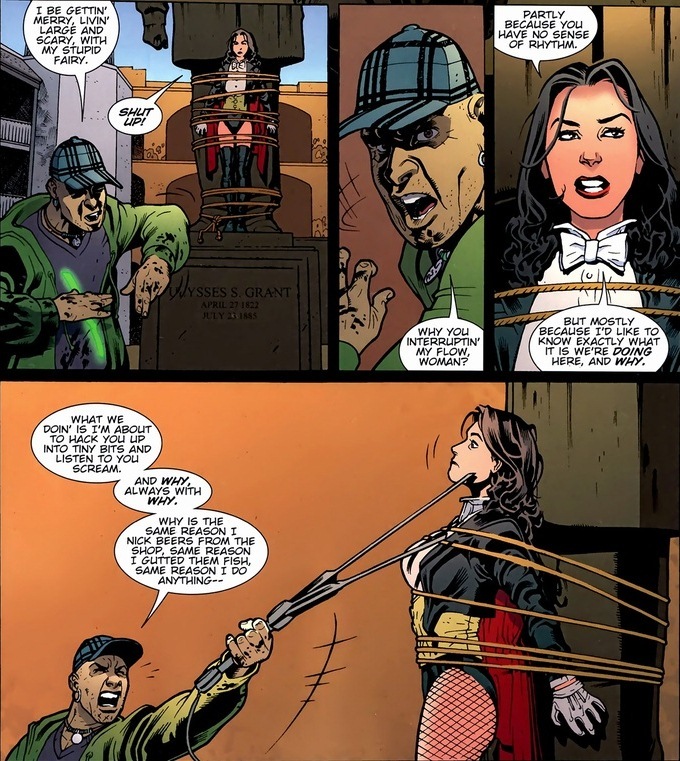 Y’see, Zatanna doesn’t really keep her civilian life secret. 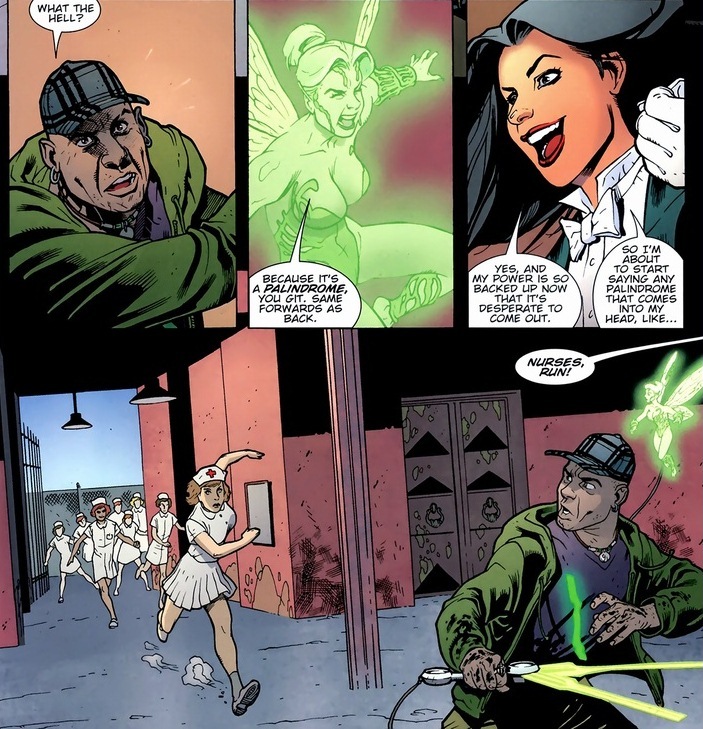 Her real name is Zatanna. She’s a famous and accomplished stage magician who performs sold out shows all over the world. Her superhero clothes and work clothes are the same thing. I guess the Justice League doesn’t pay very much. We all have to earn a living somehow. On her way home, she comes across a mermaid murder. Happens more often than you think. Oh, since how her spells are written made me confused the first couple times, just in case it throws you off – her backwards talk is still read from left to right. So she said, “Take me to the one who killed them!” Yeah, magic cuts out a bunch of the detective work. 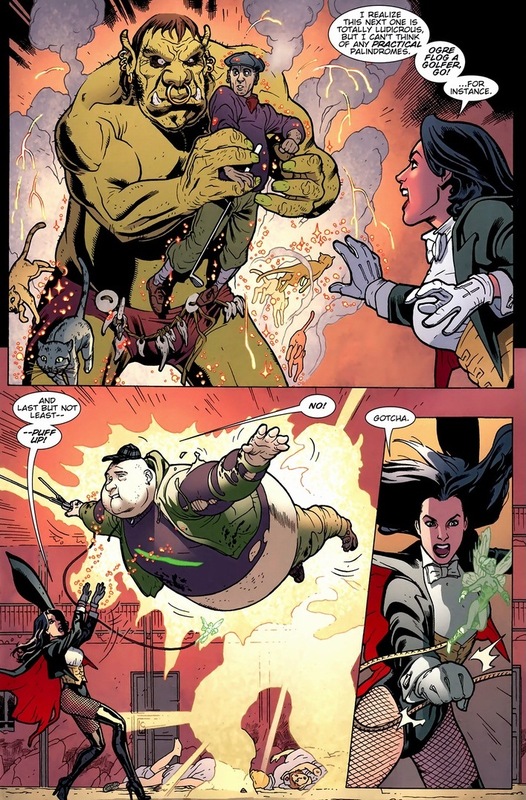 What makes this guy special or even remotely challenging for one of the most powerful magicians in the DC universe? Well, now we have a problem. Since the dude can “rewind” time ever so slightly, her words don’t come out backwards anymore. And as you can expect, she loses the first fight quite badly. Luckily with psychopaths, they never kill the protagonist in the first battle. 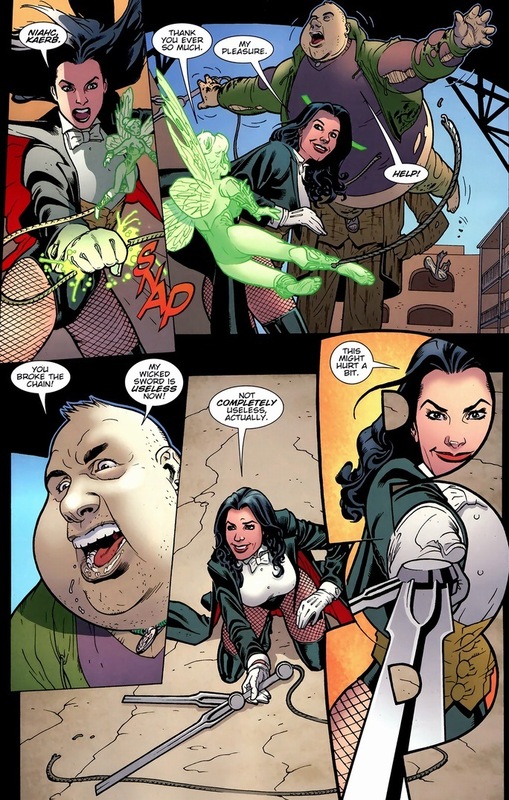 Nope, supervillains always have to savor their victory with subtle perverted undertones. To build suspense, I guess. 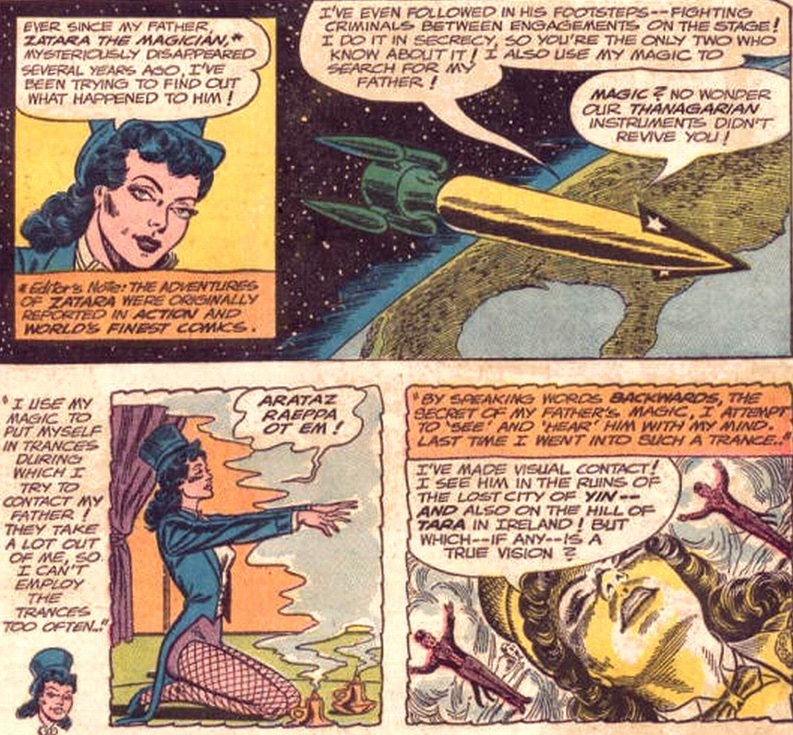 C’mon, this has to be the first time in comic book history that a supervillain has been brought down with palindromes, the most fearsome of English poetic devices. Y’know, there are some benefits to having a superpower that makes anything possible. I like how the last panel doubles as a sound effect. 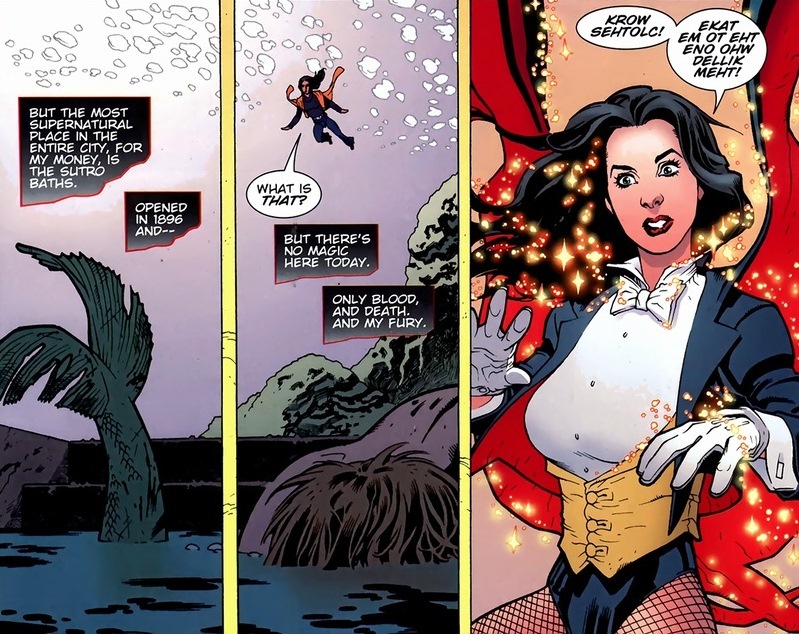 With that, Zatanna defeats another baddie and makes oceans, pools, and hoses safe for mermaids everywhere. Happy endings are the best endings. 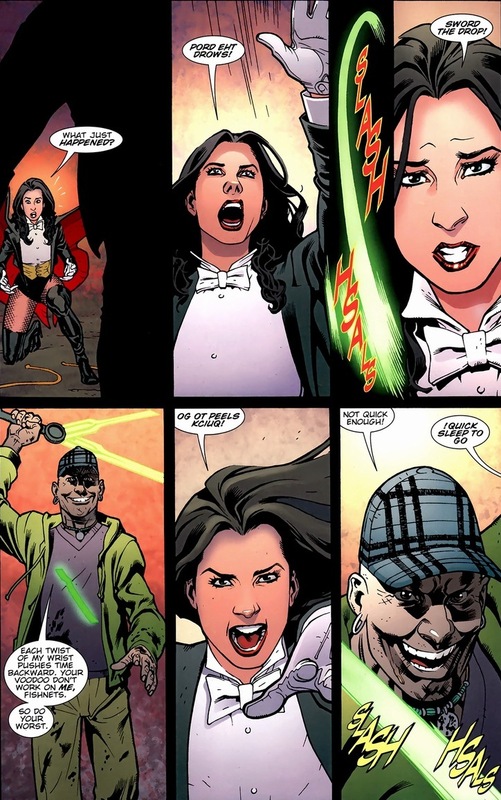 I read a lot of reviews of Justice League Dark, and 9 times out of 10 they included the statement “I love Zatanna”, or something like this. I was surprised to find out how beloved this character is. 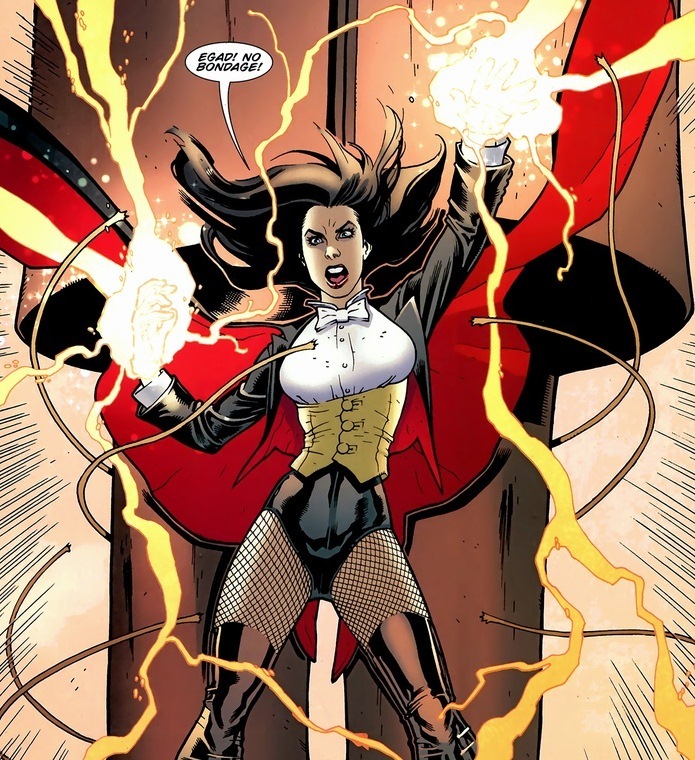 I know that blogs don’t perfectly reflect the tastes of the general public, but I think that a Zatanna solo series would be a hit. Backing up your faxes can be a trouble, especially when you use an older kind of fax device. You can frequently finish up with massive piles of papers on your desk, in file cabinets, and in briefcases. Paperwork can be misplaced or lost easily, especially if you get a great deal of junk faxes and unimportant paperwork mixed in with them. How can you solve these issues, though? Now while still in the Google Play shop, search “Astro Manager” and obtain Astro File Supervisor with Clouds. Open up this application, (you’ll need to be registered with some cloud services like Facebook or Google Drive) established up your cloud service (too poor they don’t have Amazon Cloud!) and then you’ll see it lets you swipe still left or right. Swipe to the right (which indicates clicking the still left mouse button and shifting the panel to the still left, if this could get more perplexing) click on Application Manager. You’ll see the applications installed under “Installed Apps.” Scroll on down to WORDSearch and click on the three verticle boxes to the right, and click on on “Backup.” Once you’ve carried out so, swipe the panel back again to the still left so that you’ve received a tree of directories on your get virtual sms number. For tons of features integrated. Quit having to pay extra for contacting features, as most VoIP providers provide many attributes for free. Some of these attributes can be a three-way calling, voicemail, voicemail to e-mail, E911, caller ID and a lot more. The Wizard of Oz is a fantastic instance of what not to do to develop your company. By staying away from some of Oz’s important errors, you can creative a customer service technique that will advantage your business. And the biggest benefit – IT’S Inexpensive! I spend $14.99 plus some tax and this kind of, but not the ump-teen taxes, charges, fees, etc. like the phone company costs. The Wizard of Oz still left a great deal to be preferred when it came to consumer service. Discover from his errors and your customers will be saying there’s no location like your small business.